Khadijah, here, BetterBio’s founder with some exciting news – not only are we teaching teens how to write about the science that impacts their worlds, but I’ve launched a campaign to do so, myself! Please check out my campaign on Beacon Reader, and subscribe for only $5 a month to get the real scoop on food, food science and our environment. Thank you!!! The Importance of Doing It Ourselves Here in the U.S.
Like many other countries, the United States is rife with health disparities between the rich and the poor. Aside from the disparities based on pure economics, problems include poor access to vaccines, especially for hepatitis and childhood diseases like measles; inadequate research on diseases that primarily impact upon the poor, such as toxocariasis, toxoplasmosis and even common parasitic infections; and, of course, rising health care costs that weigh disproportionately on those without independent means. One issue that hits harder than most is simply not having access to healthy food. The US government has itself issued studies on “food deserts,” areas of the country with little access to proper food and nutrition. And even if food is available, that doesn’t imply that it can be considered proper nutrition. The sad truth is that it is far cheaper to get fat in America on empty calories than it is to eat a balanced diet. Instead of waiting for governmental change, such as Michelle Obama’s Step It Up Intiative, Americans are meeting their own food supply issues with local farming projects. Windowfarms, for example, is a community that uses simple botanical practices to turn seemingly infertile urban space into a healthy, sustainable and green food supply. Rather than relying on access to private or community rooftops to gather sunlight and water, their method allows for nutritious plants to be grown with no more than a window. 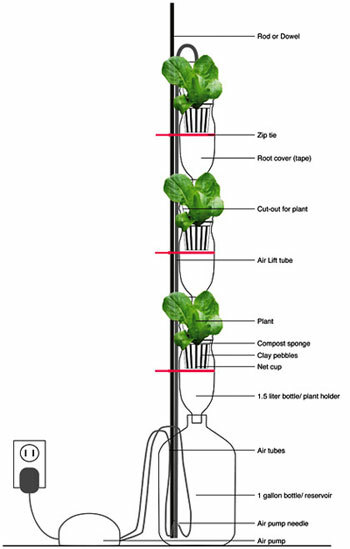 It works by using a pump to recycle water and nutrients through a system of hanging, vertical planters (that can be made from something as simple as a recycled bottle). The end result is not only a locally grown and nutritious food supply, but a reduced carbon footprint and reliance on outside means of sustenance. While Windowfarms is small-scale by design, other DIYbio initiatives are aimed at larger questions like the mechanisms of spreading disease. The BioWeatherMap project is a citizen-scientist-led project that aims to determine how the microbial life around us spreads and changes. 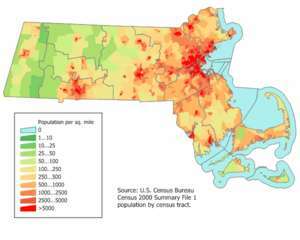 Bioweathermap gives contributors without lab coats or Ph.D.s and opportunity to engage in the project, allowing everyday people to participate in research with potentially far-reaching effects. Participants are encouraged to attend BioWeatherMap events in their city, where they are provided with tools and instructions for collecting specimens from approved surfaces, along with the date, time, geolocation information and any other relevant data. The event organizer then collects swabs and sends them to a sequencing facility, where it will be tested to give an accurate account of biodiversity across a variety of locations. Finally, the data is published in an open repository for the benefit of all. Unfortunately, Jackson and his team at the Open Science Initiative face limits on time (“we haven’t gotten to the stage of building partnerships with more established projects yet”) and staff (“we’re lacking a real community engagement point person or strategist right now in the organization”). Given the limitations on thought leaders’ capacity, it seems possible that without a large grassroots movement towards broader social justice, DIYbio will remain a marginalized, closeted movement showcasing the very best of both scientific and human intention. The final message that leaves, ironically enough, is that it is all still Do-It-Yourself. Chances are you’ve never heard of Chagas disease, unless of course you’re among the 40,000 people infected every year. It usually starts with a visit from The Kissing Bug, a blood-sucker named for it’s odd habit of “kissing” its hosts on the face during the night. The disease can be countered with antiparasitic treatments if caught early, but once it reaches the chronic phase the best you can do is delay or prevent its symptoms. These can include potentially fatal heart weakness or failure, malnourishment, or even dementia and motor impairment. There is no cure. Diseases like Chagas are common and can have devastating effects in the developing world. There are a number of institutions that work to eliminate these and other health risks in the public interest – governments, inter-governmental agencies like the World Health Organization (WHO), and non-governmental organizations and charities. Many of their efforts have been successful and well known (thank you, WHO, for eradicating Small Pox), but their scale is limited by the amount of funding and political will they can muster. In an attempt to reach some of the more neglected areas of the world, some scientific progressives have begun advocating a less orthodox approach – do it yourself.The DIY method, now a full-fledged underground movement, is based upon the belief that the average person can not only become equipped to solve their own challenges, but also contribute to the greater scientific community through open data sharing. This requires access to three things that most don’t have – proper equipment, training and opportunities for engagement. While there have been success stories in the States, providing these amenities in the developing world is a greater challenge. To find out whether or not DIYbio can help solve health issues abroad, several pioneers have begun the task of breaking down these barriers. 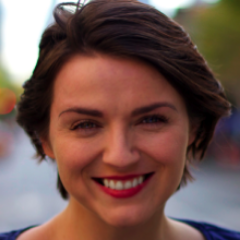 Nina Dudnik, meanwhile, seeks to not only bring affordable equipment to developing countries, but also provide much needed training. The difference is that her focus is on universities. Dudnik is the founder of the non-profit Seeding Labs, which collects unused equipment from labs in America and sends it to universities in Africa, Latin America and Asia at affordable prices. They also provide training both abroad and through intensive fellowship programs here in the States. According to Dudnik, their equipment has already been used by thousands of students and has directly lead to over 125 new publications, two new patents and a tool for diagnosing multi-drug resistant tuberculosis – a disease impacting one-third of the world population and an even greater percentage in poor communities. Having affordable equipment and training is essential, but it doesn’t guarantee engagement. Few in their lifetimes are able to get hands-onexperience with the wonders of science, and even fewer get the chance to create real results. This is where companies likeKeegoTech come in. 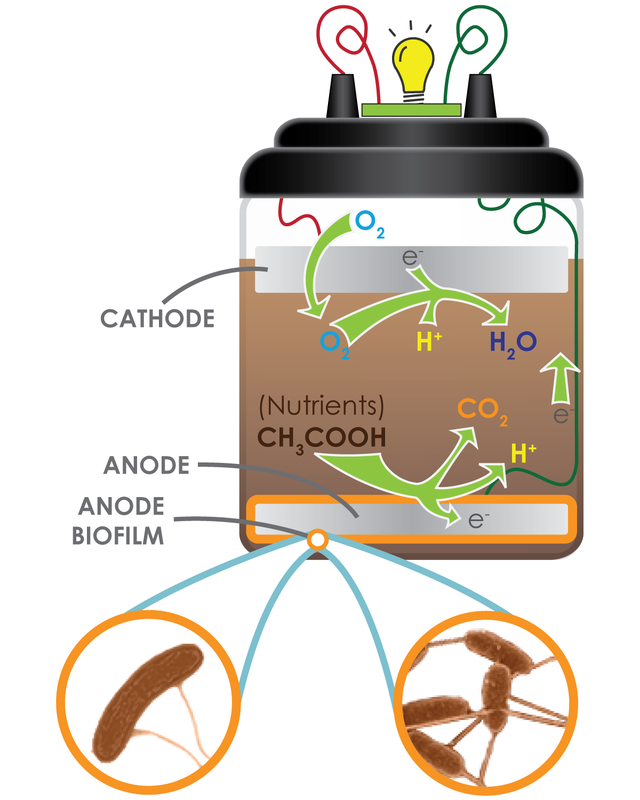 Their business is built on a microbial fuel cell (MFC) known as the MudWatt. In simple language, it’s a battery that runs on dirt. The technology is still too young to create enough power for practical use, so instead they sell the MudWatt to schools as an educational tool to engage children in science. In doing so, they have discovered that scientific advancement can come from anyone. Says their co-founder, Keegan Cooke, “MFC technology has the potential to become a cheap and reliable way of charging small electronics, but we’re not quite there yet. Scientists don’t yet know the best arrangements of electrode material or organic components to create enough power. So we invite students to experiment with our kit and post their findings on our community site. This has led to some very interesting ideas we never would have thought of.” Cooke’s favorite example is an eighth grader in California named Ricky, who alongside his father was able to double the output of the MudWatt from dirt in a local riverbed – a sample that KeegoTech is now working to analyze. But while they see this approach working in the developing world, their ability to successfully focus their efforts there is still uncertain. Organizations like LavaAmp, Seeding Labs and KeegoTech have begun to demonstrate what can be done when we make it possible for the average person to engage in science. And they are already getting investors. Seeding Labs’ fellowship program in the U.S. is underwritten by Novartis. 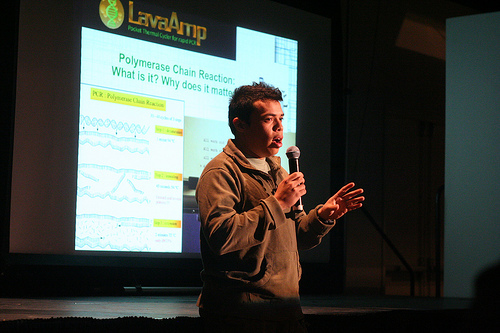 LavaAmp was recently awarded a $40,000 grant from Start-Up Chile, a program run by the Chilean Ministry of Economy. But the movement is young and unproven, and the likelihood of continued funding remains unsure.